A couple of months ago, around Thanksgiving, I started coughing. It would start as a tickle in the back of my throat and progress to a dry cough. Nothing to worry about—perhaps I inhaled a cookie crumb. Perhaps it was an allergic reaction, or the beginning of a cold. After a day or so, I developed chest tightness—a sure sign of asthma. But it came and went. Whenever I used the inhaler, it went, a few hours later, or perhaps the next day, it came. I wasn't concerned. I knew it would pass. It always had in the past. The coughing continued through Christmas and New Years, which was when I was hit by the flu, which had me coughing my lungs out through the night for several nights in a row. Finally, a couple of weeks later, the virus made its way through my system, leaving the asthma behind. Thankful that I wasn't hacking twenty four hours a day, I barely noticed my difficulties breathing, until my cough got wheezier and wheezier, often waking me up at night. At first I only needed to use my inhaler once a day. About a week ago, I noticed I was using it more than three times a day. Finally, yesterday, two months since Thanksgiving, it clicked that the inhaler was only effective for an hour at best—it was time to see my doctor, my asthma was not under control. Oops—my asthma was definitely not under control. I told her about the first time I was put on systemic steroids almost two decades ago. I'm one of those who become euphoric on steroids—there's nothing I can't do. Our VCR had eaten one of the kids' favorite videotapes. Bill, my husband at the time, had just purchased a new VCR to replace it. And I, in my steroid induced insanity, decided to rescue the videotape. I didn't think I could do it, I knew I could. Flying high as a kite, I very happily demolished the VCR. After I removed the tape, I found I couldn't put the machine back together. No worries—we had a new one on hand. Attempting to straighten out the wrinkles, I ran the mutilated portion of the tape between my thumb and index finger, then wound that portion back onto the video cassette. 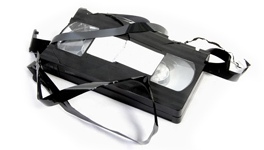 To my surprise, similarly to the old VCR, the new one also munched on the videotape and choked on it. This time, Bill put his foot down—he firmly declined my offer to make another rescue attempt. He didn't even allow me to try to open up the machine to take a peek. Still flying high, I quickly forgave him and moved on with my life. After hearing the story, Joyce pointed out that I don't own a VCR. Perhaps I should back up my files on my laptop.